Removing stumps is typically more arduous than cutting the actual tree. We’ve seen every method employed, from fire to salt and barbaric axe hacking. These methods are a very antiquated approach to a simple problem. Technology has afforded Savannah Tree Service the ability to remove tough well anchored multi-stump trunks in minutes via remote control! No need to chip away at a stump with a drill or an axe. Our company has invested in a hurricane stump cutter which has a 360-degree angle and cuts above and below ground. 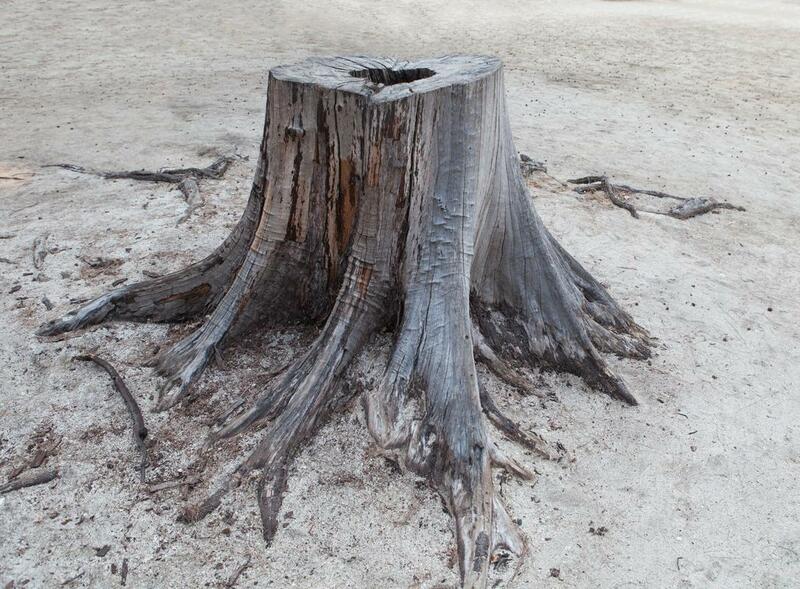 The remaining stump can be ground into dust or chopped up and sold for firewood or mulch. The right equipment is crucial when removing stumps. You may recall the men in your family performing this back-breaking work manually. Fortunately, that struggle is a thing of the past. A distant memory to be indoctrinated in the history books of agriculture and gardening. We made it a point to invest in the Hurricane Stump Cutter. This magnificent piece of machinery has a 360-degree rotation, cuts above and below ground and comes with a remote control. These days, very little labor is required to grind stumps. The remote control provides better operational oversight and keeps the operator safe from flying debris. Those unsightly stumps that have been plaguing your land can be processed into dust, firewood or mulch. For your convenience, we will haul the dust way. If you or your loved ones have a need for firewood, we would be happy to process it for you on the spot. We’ll leave you with fodder for those cool winter nights. We can also transform your stump into mulch. Mulch is for more than aesthetics; it was created to lend moisture to your tree’s root system. Let us know what your preference is and we’ll make it happen. When stumps are located near valuable equipment or property, we erect a protective barrier. We had a scenario in which a tree stump was located half a foot from a home’s HVAC unit. Had we attempted to remove it without a protective barrier, we would have damaged the unit and the home’s windows. To prevent that from happening we installed a temporary barrier to protect the property and unit from flying debris. The remote controlled stump grinder was able to get within inches from the homeowner’s property without incident. If you are in a similar situation, it would be our pleasure to erect a protective barrier for you too. What seems like a relatively simple job can quickly evolve into a dangerous situation. It is imperative that proper health and safety measures are put in place to ensure the welfare of all involved. Our experienced tree experts always wear safety glasses, ear plugs, back braces and gloves. For large projects we wear hard hats and fluorescent safety vests. To protect your family and drivers in oncoming traffic, we use orange cones to block the area and signage to warn people that work is being done ahead. If we have to make a choice between people and trees, we’ll choose people every time.